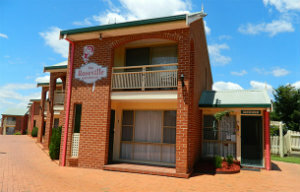 THE ROSEVILLE APARTMENTS is situated in TAMWORTH a major Regional Centre in Northern N.S.W. situated on the New England Highway (and Oxley Highway) half way between Sydney and Brisbane. ONE BEDROOM SELF CONTAINED APARTMENTS. Parking at door. 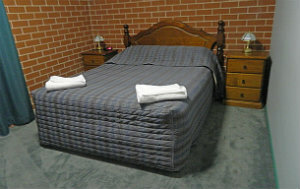 Bedding Queen and one Single in bedroom each with Electric Blanket, Linen Supplied. Full Kitchen, crockery and cutlery supplied, dishwasher, full sizefridge, oven/cooktop, microwave, dining table, washing machine/dryer. Lounge Room with 106cm LCD TV, 2 lounges, DVD Player. Two Reverse Cycle Air Conditioners. TWO BEDROOM TWO STORY SELF CONTAINED TOWNHOUSES. One garage for each Townhouse. Ducted Reverse Cycle Airconditioning. Upstairs- Bedding Queen bed in Main bedroom and two single beds in the 2nd bedroom, all beds have Electric Blankets, Linen Supplied. Bathroom with with shower over a full sized bath- toilet. Downstairs- Full Kitchen, crockery and cutlery supplied, full size fridge, oven/cooktop, microwave, dining table. Laundry- washing machine and separate dryer. Toilet (separate room). Lounge- with 106cm Plasma TV and DVD Player and two lounges.